About the group A group for images that illustrate the history of Wiltshire. 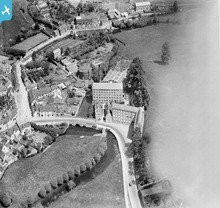 [EPW032617] The Avon Silk Mills Co Limited Silk Mill, St John's Bridge and St John's Street, Malmesbury, 1930. This image has been affected by flare. 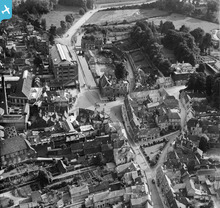 This photo of Malmesbury shows that not a great deal has changed. 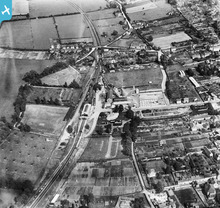 The silk mills are now residential (Avon Mills) and the gas tanks are no longer there. Fortunately, as of 2013, the green space is still green, though plans are afoot for a supermarket development. A fine photograph of Warminster Railway Station when it had an overall roof. So how many cattle markets did Wiltshire have, and have they all now gone? 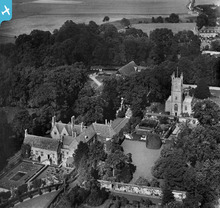 And, lastly, a close up of Avebury Manor and St James's Church. 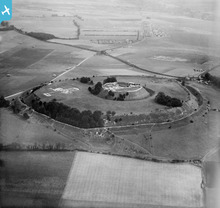 Another photograph discussed at the get together in Chippenham: stunning Old Sarum. 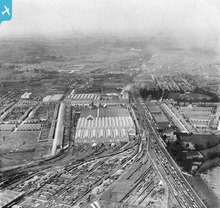 A view of Calne and the Harris Bacon Factory had also been shown at the event. This image has been shown as part of the event held at the Wiltshire and Swindon History Centre - as a reference to everybody who attended and would like to revisit the selection! So pleased to see that we finally have a Wiltshire group on the website - welcome! And you have even picked one of my favourite images as your cover photo. I am looking forward to a lively discussion about the history of this beautiful county!